In the fourth inning of an otherwise unremarkable game at the Polo Grounds, Orioles left fielder Ducky Holmes struck out. On his way back to the bench, Holmes responded to the heckling of New York fans by referring to the Giants team owner as a Sheeney. The utterance of this now obscure anti-Semitic epithet would have immediate consequences, setting in motion events that prompted the Giants to forfeit the game. But the incident would produce far more than just another entry in the New York loss column. The Holmes remark helped fuel a bruising 17-month battle among National League magnates that culminated in nothing less than the restructure of major league baseball. Nothing so momentous was in the offing that July 25, 1898 afternoon as a crowd of some 3,000 gathered for a Monday contest between two teams struggling to maintain contact with league leader Cincinnati. Manager Ned Hanlon’s Orioles boasted a Hall of Fame-studded lineup ( John McGraw, 3b; Hugh Jennings, ss; Joe Kelley, cf; Willie Keeler, rf; and Wilbert Robinson, c) but inconsistent pitching had hampered the team, then mired in fourth place with a 48-32 record. The sixth-place Giants (44-38) were struggling as well, in imminent danger of falling out of the first division in the 12-team circuit. 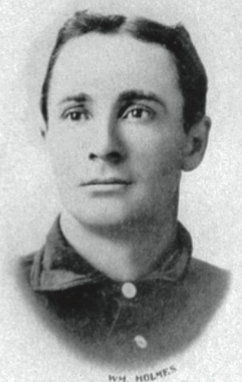 Although New York featured Cooperstown-bound George Davis at short and fireballer Amos Rusie on its pitching staff, the team had more than its share of non-entities on the roster. Worse yet, the dominant actor in team fortunes did not even wear a uniform. He was, rather, Giants majority owner and team president Andrew Freedman. An astute businessman and powerful Tammany Hall insider, Freedman was a train wreck as a baseball magnate. His acquisition of the financially troubled New York franchise in January 1895 had been hailed, but the combination of Freedman’s autocratic manner and his abrasive personality quickly proved toxic. Frequently out of step on league affairs and isolated, Freedman fought—at times, literally, for he was short-tempered and pugnacious—with most anyone who opposed him. In the process, the Giants boss managed to alienate NL officials, fellow team owners, players, umpires, the sporting press and baseball fans, all in about equal measure. By July 1898, Andrew Freedman was easily the most detested figure in the game. During that summer, Freedman, preoccupied with business and political concerns, had made only infrequent appearances at the Polo Grounds, the last being at a July 4 game marred by an unseemly public row between Freedman and umpire (later NL President) John Heydler. Freedman had not been to the Polo Grounds since. But as the opposing pitchers for the July 25 contest, Jerry Nops, a young southpaw on his way to a 16-win season for Baltimore, and Giants veteran righthander Jouett Meekin, began warming up, Andrew Freedman assumed his seat in the owner’s box. Both Nops and Meekins were in good form and at the end of three crisply played innings, the score was knotted 1–1. With one out and one on in the top of the fourth, Orioles left fielder Holmes, a former Giant, came to the plate. He promptly struck out, much to the delight of jeering New York fans. Unidentified Fan: Oh Ducky, you’re a lobster. That’s why you’re not here anymore. Holmes: Well, at least I don’t have to play for a Sheeney no more. Whether Freedman heard the slur personally is unclear. But if not, it was swiftly relayed to him. As the teams switched sides, a deeply offended Freedman dispatched factotum Fred Hoey toward the Baltimore bench with the demand that Manager Hanlon remove Holmes from the game. Hanlon refused, referring Hoey to home plate umpire Tom Lynch. At this, Freedman, escorted by his NYPD bodyguards, strode onto the field to confront Lynch directly. But Lynch refused to take action, informing Freedman that he had not heard the offending remark. With Holmes resolutely stationed in left field and the Giants due to bat, a near apoplectic Freedman had had enough. He immediately ordered Giants player-manager Bill Joyce to keep New York batsmen on the bench. Seeing no way beyond the impasse, umpire Lynch thereupon forfeited the game to Baltimore. The final score was listed as 9-0. The incident left league officials in a quandary. Freedman, branding Holmes’ remark not only personally offensive but “an insult to the Jewish people and the Hebrew patrons of the game,” demanded disciplinary action against Holmes. Simultaneously, Hanlon demanded punitive sanctions against Freedman for causing the game forfeiture and for withholding Baltimore’s share of the July 25 gate. Trying to placate both sides, the NL Board of Discipline only made the situation worse. The $1,000 game forfeiture fine imposed on the Giants aggravated Freedman while the season-long suspension imposed on Holmes infuriated Baltimore, as well as players throughout the league. The truly pivotal event, however, was the stance publicly adopted by Freedman’s fellow team owners. Deeming Holmes’ suspension illegal (because it had been imposed without first affording the player a hearing), the NL magnates sided with Holmes and urged the lifting of the sanction on him. This development stunned Freedman, who viewed the controversy as a matter of personal honor. In Freedman’s mind, the magnates’ position and the subsequent reinstatement of Holmes represented nothing less than league countenance of a gross insult. And Andrew Freedman would not abide it. Freedman’s revenge took the form of a punishing financial lesson for the other NL owners. Using his personal fortune—Freedman’s wealth probably exceeded that of the other NL magnates combined—to ruthless advantage, Freedman decided to effect the ruination of the league’s most important financial asset: Freedman’s own New York Giants franchise. Over time, the lost revenues occasioned by fan disinterest in the dismal 1898–99 Giants teams forced the other owners to capitulate to the game-related demands that fig-leafed the deeply personal nature of Freedman’s ire. Syndicate club ownership was abolished and the NL contracted to eight teams for the 1900 season, the structure that it would maintain for the next 60 years. And all because of a journeyman ballplayer’s insult to Andrew Freedman on July 25, 1898.